Bring butter and spice mixture to a boil for 2-3 minutes stirring frequently. 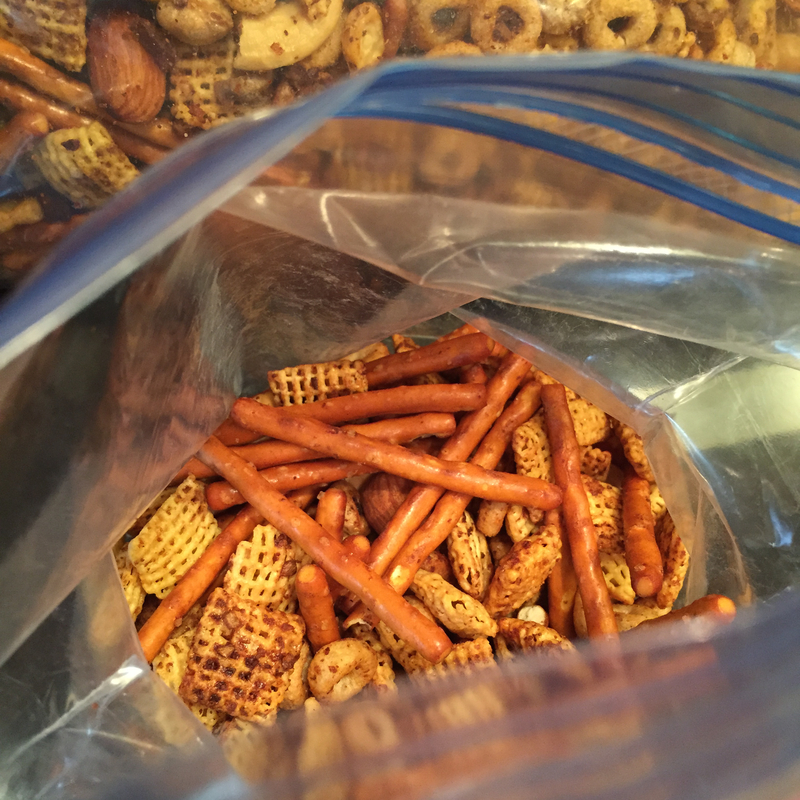 Mix 4 cups each of honey Chex (yes honey Chex, it isn’t overwhelming and contrasts with the spices perfectly. Trust me!!) and Cheerios together. Add in 3 cups of pretzels and 1-2 cups of mixed nuts in a large bowl. Mix together well and add the butter and spice mixture. You may need to separate the butter and dry ingredients into a few large bowls in batches for easier mixing. Place bits and bites into glass or foil cooking pans in the oven at 300°F for 45 minutes stirring every 10-15 minutes until the bits and bites are crisp and golden. If your oven cooks too warm turn the temperature down to 250°F. If you follow a gluten-free diet be sure to substitute for gluten-free ingredients and check that your spices, Tamari, Worcestershire and soy sauces are all gluten-free. If your bits and bites are still soggy after 45 minutes of cooking try heating the oven up to 350°F on convection mode for 5 minutes to see if that crisps them up. If you want to add more fibre try adding 1/2 cup of chia and flax seeds before baking. Look for another high fibre cereal to add or try adding multigrain versions of the cereals listed above. You can also add a bran based cereal to the mix. Once cooled store in airtight containers or in plastic zipper bags. Excellent, let me know what you think. It’s a household favourite here. Although I do recommend you wait for a cooler day as you need the oven.